A fab pair of socks below, but first, a brief announcement. I spent some time tonight updating my website, and while most of the changes will not be immediately evident to you, if you come across any links which don’t work, or if something looks funky in your browser, please let me know. I try my best to make this lil’ blog compatible across many (definitely not all) browsers, but I know that’s impossible. If you haven’t already, I urge you to switch to Firefox. Really. Especially if you’re still using the tool of the devil. Sigh. No, you didn’t miss it. Progress reports often become so… boring. Once the pattern is established, and there are no more troubles on the horizon, I find myself wanting to post about anything but the boring progress. “Look, one more inch of the same ol’ thing!” – Boring! Click here for a steamy photo (like PG-rated, hehe) where I inadvertently show you some leg! Look! All the basic details are on the custom label! Very convenient for me ;). The label is simply a software/printer trick, which Carole explains so nicely here. I got a kick out of incorporating the trademark sock monkey and yellow background ;). I also managed to squeeze in the sockapaloooza logo. In case playing with Illustrator and Photoshop is not your cup of tea, Alison also has some fabulous ones available on her site. This pattern has a dual personality. On the one hand, it is so, so stretchy, and has such wonderful memory – snug around the ankle, not tight around the calf. Plus I added just a little bit of calf shaping, considering that the socks go up very high. I think they fit really well as a result. On the other hand, the pattern is composed of 44% twist stitches (knit second stitch, then first). Damn! Time-consuming, and muscle-demanding. I don’t mind. In fact, I’m considering knitting a pair (or a slight variation) for my grandma. But would I recommend them to anyone else? Hmm… I guess a person with a lot of patience, time, and hand dexterity ;). Here’s a close-up of the stitch pattern. Can you spot the calf shaping? I understand that the last thing I need to do is get some postcards. I may rebel and get a nice notecard instead, as I don’t really consider myself from Boston. Or Massachusetts. And possibly not even the United States. In any case, the socks are ALL SET! Woo! I like these socks – your pal will love them too and I especially like the sock monkey wrap. Wow, I love the length on these. Lovely socks, You have just made me realise I forgot to put a note in with my socks to tell my sock pal how to wash them! Too late now, I posted them yesterday to make sure they got across the Atlantic in time. I guess I will have to email her once she has got them. I probably never would have thought to look for calf shaping, but if I spotted it correctly, it’s a nice unobtrusive touch. Why is it that none of your FO look handmade? They all seem to come out so perfectly despite the drama that we hear about. 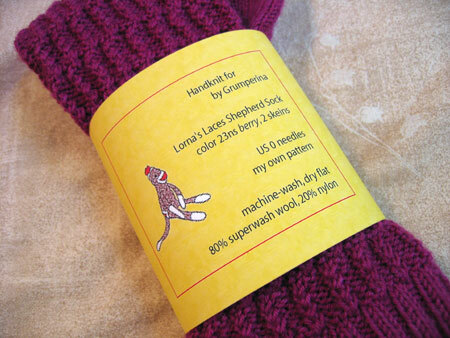 Is there a story behind how you chose a knitmonkey for your logo? Looking at those socks makes me want to eat raspberries. They’re gorgeous! Wow. Those socks are awesome! I’d be keen to try them myself, if you’re willing to share the pattern one of these days. Your sock pal is going to love them, I’m sure. They look really, really great! I love the look of the twisted stitches up close. The socks are lovely and the label is such a nice touch! very very nice, i hope one day to be able to knit that awesomely. i like the redesign (honestly i forget what changed but it seems fast and clean). love all of your knitting and hope to try some of it soon. They look great! Your pal will be very, very happy. They look great, and very cozy. I like the extra length. how do you prevent them from slouching? I love the socks. Everytime you come up with a new sock pattern, I think I’ll make socks. I never do, but I think about it. I second the ‘we need the pattern’ post. I love the color, too. Very elegant calf shaping. I’m waiting to see if Alison needs a sock savior this time around. In the mean time, I need to decide on the next socks for me. I need something to break up the Widow’s Shawl. Kathy I love the way you put so much of yourself into every project you create. The sock monkey is the perfect touch to the label. beautiful as always. and…what happened to the skirt sewing project? I made my label too and love it! I just took my custom designed banner and printed that out. Fun! Love the socks! Great pattern! The socks look fab! Looks like all that tinkering with the pattern paid off… love the color and the pattern. Those are great – a nice stretchy beautiful pattern! I so wish I didn’t have to use devilbrowser anymore – damn confines of working on a network!!! Those look awesome! That subtle twise is a nice touch! It’s all about texture, baby! The socks look great! 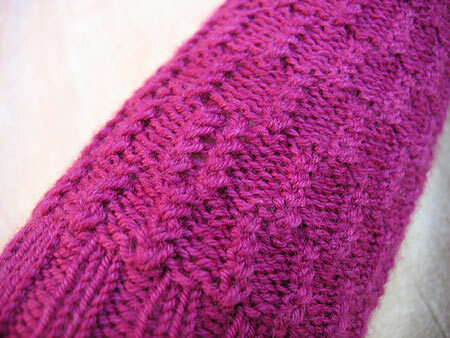 I’m using a very similar stitch pattern for my sweater, and definitely agree that it isn’t easy on the hands. Beautiful socks, but especially love the label–what a great idea and so beautifully executed! I want to knit those socks. Any chance on you providing a pattern? These turned out incredible! The label is awesome! Well done, Grumpy, well done! That color is gorgeous. Did the yarn bleed much when you blocked/washed? Lovely! I love the colour, the pattern, the shape…all so beautiful. That’s a beautiful pattern. Very graceful. Although it doesn’t sound very graceful to knit! very cool socks and great recommendation for the pattern stitch! Must try them. Although, I’m thinking of switching to cotton sock knitting for wear with summer sandals…. Beautiful socks! Your sockpal will be so pleased! Unfortunately my computer has issues with Firefox (and just issues…maybe I should get it some therapy?) but I really like those socks. Where did you get the schematic you use for your shawls? After Microsoft came out and said (paraphrased) “Yeah, our browser is broken and it’s not safe to use because bad people can use it to get into your computer and steal your information… so use Firefox.”, I’ve never understood why so, so many people continue using their browser, putting themselves at risk of identity theft and such. Not to mention how much nicer Firefox is, anyways. I love the tab feature, and I really don’t know how I could possibly go back to using something that doesn’t have it. It makes things just so much easier. Socks look great! I’m having the same twisted stitch issue on mine. What beautiful socks! I started my first pair of socks a while ago and love the whole process…I just need to find the time to finish them! What a coincidence…I just switched to Firfox also. I love it. I love them! What a beautiful colour. These socks are beautiful, I love that color! I just started some socks last night and was going to make them plain 2×2 rib, but now I’ve got some great inspiration. Dang, I learn so much from you! How do you do it? They’re fabulous. The color, the stitch pattern, the height (lately I’m obsessed with Tall Socks.) I know better than to hope that they’re for me, though; I’d never get matched with someone so nearby. I haven’t knitted socks that go up the calf because I’ve got big calves! Calf shaping sounds like a great idea – do you just add stitches as you go up (or down) the leg? Is it as straightforward as it sounds? Hey Kathy, Awesome socks! We all need to know how to make cute wraps like that for our gifts too. Okay so when do we get to see the pattern somewhere!!!!! I love them. Hey, can I ask a technical question? I’m working on some socks that are going to be just about that height. I’m afraid that they’ll want to slide right down my calves (unlike a true knee sock, which I envision, rightly or wrongly, as neatly hooking itself over my calf). Did the socks you make show any sign of wanting to slip down, and did you use any elastic in the ribbing? Very pretty, with clever and subtle calf shaping. What a lucky pal you have. Despite your warnings, I’d like to try that twist stitch you describe. My sock pal’s socks were filled with K2tog, then K into 1st stitch again before slipping both off the needle. A bit tricky and hard on the wrist at first, but I got the hang of it. I like how you alternated the purled and twisted stitches every 8(?) rows. It doesn’t really look like ribbing, and yet it is. Please, please, please share the pattern. Not, you know, that I have ever knitted socks – but I am seriously considering it! I actually just ordered some Rainbow elastic thread for a thigh sock and some KnitPicks dye your own Yarn to try some socks. But I really want to make these Twisted Sister Stitch socks – they are incredible. Just started Jaywalkers yesterday (in the hyoooooge size, cuz I have super big feet! ), and I’m loving them – now I come across these gorgeous socks and I must make them! I even have this yarn in my stash! Please, please post the pattern!!! Or sell it – I don’t care, I’ll pay! !